My husband, like most men, is a big fan of buffalo chicken wings. 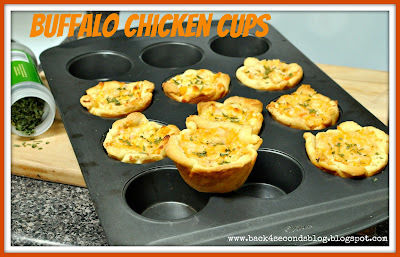 Funny thing is I don’t actually like buffalo chicken wings, I just like dishes made with buffalo style chicken. Weird, I know. But this fun dish I created was a big hit with both of us. It had the buffalo chicken flavor, but was nicely complimented by the ranch, veggies, and crescent cups. In large bowl add cooked, chopped chicken, peppers, onions, ranch, buffalo sauce, and mayo. Mix together. Roll out both packages of crescent rolls just enough to press seams together. Then cut into 16 squares. Place squares into greased muffin tins, molding them carefully into cups. Fill with chicken mixture and top with cheese. Bake for about 15 minutes or until crescents start to brown. Sprinkle with parsley and serve!